The Ewa-Marine U-AXP100 Housing is an economical solution for using any autofocus SLR camera with shoe-mounted flash near or just under the water's surface, manufactured from double laminated PVC and with an optical glass port. It is rated for dives of up to 164 feet (50 m) depth; perfect for snorkeling, diving, or generally sandy, dusty, and humidity weather conditions. The U-AXP100 gives your camera and flash the best possible protection while being fully operable. When not in use, it is relatively light and takes up little space. The U-AXP100 housing accommodates an autofocus SLR camera with shoe-mounted flash, with the maximum dimensions for the whole kit being 7.5 x 10.75 x 6.6" (190 x 275 x 170mm) WxHxD with lens and a 77mm maximum lens filter thread (the optional 82mm ring #CA82 is required for 82mm lenses). Amongst others, the U-AXP100 fits the Canon EOS-1 and EOS-3 and Nikon F4/F5 film cameras, and the Canon EOS 1D/1Ds/10D + BG-ED3, Fujifilm S2 Pro, Kodak DCS 14N, and Nikon D1h/D1x/D2h and D100 with MB-D100. 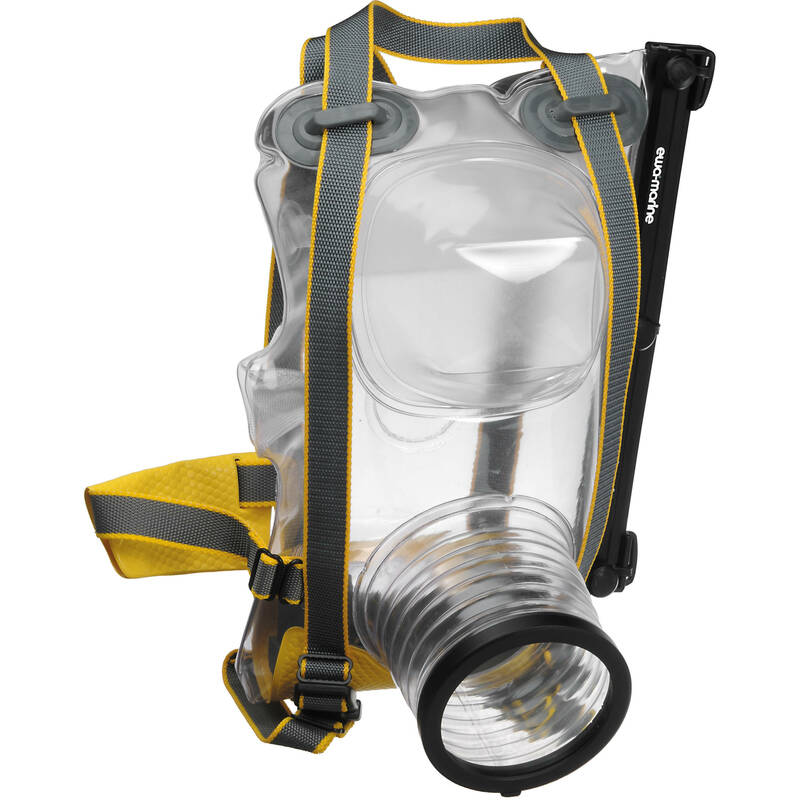 Box Dimensions (LxWxH) 16.0 x 13.0 x 3.0"
U-AXP100 Underwater Housing is rated 4.3 out of 5 by 8. Rated 3 out of 5 by RODRIGO D. from It is what it is Well the product is used to protect your camera from water and for diving. I use it for water sports photography. Well it does the trick and will keep your camera dry which is very important. You can get great images from this product. being in the water for water sports photography really gives a unique look. Little hard to use but after some time you will figure out the best way to use it. On a zoom lens it is very difficult to keep the zoom backed all the way out because the front of the bag constantly pushes against the lens and slowly spins the zoom all the way back out. A fixed lens or a piece of tape to hold the zoom in a fixed location is the best way to use this bag That I have found. Rated 4 out of 5 by Lenn from Great for Canon 60D Bag took about 14 days to be delivered as promised. I have used it a couple times in the pool and it works great with the Canon 60D, Canon 17-40L, and Canon 580EXII flash. Originally I purchased it thinking I would use the Canon 24-70 2.8L lens with it, but it does not work well with this lens. The bag under pressure collapses the lens to its 70mm zoom and that is too long for underwater use, so I switched to the 17-40 which has internal zoom and works much better. You cant zoom underwater, but I preset the zoom at 17 and its good to go. Rated 3 out of 5 by Anonymous from underwater housing The instructions provided are not very helpful but after a couple of attempts to setup the bag for the camera it worked. You have no access to camera controls, so program and auto focus is about all you have access to. Rated 5 out of 5 by Anonymous from Awesome & Affordable U/W Housing!!! I bought this because of the price compared to full plastic or aluminum housings. I wanted to get into underwater photography, as I love to dive and wanted better pics than what little point and shoot u/w cameras could give. I used this w/ a Nikon D50, Sigma 10-20mm, and the SB-600 hot shoe flash. I wanted the larger housing specifically to have a strobe underwater; w/o a flash, underwater photographs are blue or green below about 10'. I used it on a dive in Grand Caymen, best pictures were taken w/ the flash, (took some w/ and some w/o for experimenting w/ u/w photography) and snorkeling in Cozumel. I have also used it in pool settings. I recommend getting weights. I had problems at first because it requires air before you dive, which compresses into the body, but also makes the bag shrink around the camera, reducing functionality of the camera if you don't have enough air in it. But, the second dive, I strapped on lead diving weights and was able to have a lot more air in it, and not have a problem submerging the system. (Imaging trying to dive w/ a pool floaty toy... weighted it was fine) Also, another word of advice, assemble you camera IN the case. I put the lens in first, then the flash, then the body, attached the lens to the body, then the flash to the body. Its just easier than trying to make rubber rub against plastic and move things around. Also USE THE SILICA PACKS! Warm tropical air and/or breath to fill the housing w/ air, then submerge in cold (er) water, it will fog up. I did not have a problem as long as I had the silica packs in it, but I did in some pool settings when I didn't. Pros: Price, light weight, flat to pack in luggage, able to use wide and super wide angle lens' and flash. I had no problems diving up to 60' (deep as I went on that dive), and having functionality. Cons: More susceptible to user error. The design is sound if you follow the instructions and test it before you dive. I had no problems diving up to 60' (deep as I went on that dive), and having functionality. I did not correctly seal it once, and it leaked in a pool test, saw the problem, tightened it up, worked fine. I'm giving it 5 stars because of what it is. I am not comparing this to a $1000k + underwater housing system. I'm stating the product functions as designed, does what it says it will do, is user friendly, and gets people into u/w photography w/ quality cameras w/o breaking the bank. Rated 5 out of 5 by JOHN from IT WORKED FOR THE PURPOSE INTENDED... My canoe I was riding on capsized before I had this product. Needless to say, my expensive DSLR and lens were damaged beyond repair. Bought this product to protect against water spray, dust, and overall protection from elements - and yes, from possible capsizing. It worked for the purpose intended. Will test it on shallow dive when opportunity arises. No leaks or moisture problems.However, it's tough but it's still plastic. So, you want to protect it from pokes and scratches or you just threw away almost $$. Rated 5 out of 5 by Mike FromMontreal from It works! Here is the most important thing you will need to know... IT WORKS! Putting your 5D Mark III into a body of water with a $2500 dollar lens and a flash does not feel natural in any way the first time you ease it into the water. But life is life and if it was going to leak I was going to find out the hard way, It did not leak. Humidity packets that came with it got rid of fog. The only tricky thing is that you really need to dial in your settings before getting in there, or use it on full auto. I shoot in Pools in Manual and it worked fine with a bit of going back and adjusting settings again. Direct flash looks terrible underwater as it does above water, so I am still not sure I will use flash again for my underwater needs. Great thing is I can turn flash on and off through the housing anyways so, not a big deal to have there just in case. The plastic does warp your lcd image and makes it look cloudy, the first time I thought everything looked terrible until I took it out of the thick plastic housing. Bottom line, this works, and the company that makes it guarantees your gear in case of manufacturing failure. KEEP YOUR RECEIPT! Rated 5 out of 5 by Anonymous from Worked good for me I went diving for the first time and bought this housing to take my Canon T3i underwater with me. I only dove 7 meters/21 feet, but it worked perfectly fine for me. No leaks or moisture inside at all and it fit my Canon 10-22mm EF-S lens perfectly. There was plenty of room for the flash too. I couldn't really change settings underwater while diving, although I could in the housing above water. I was hoping to switch to movie mode at some point, but wasn't able to. In reality, I don't think I would have been able to hold it straight in front of me steady enough while diving in order to do video anyway. That's probably just because I have no diving experience though. I set it to A+ (scene intelligent auto) mode for the underwater shots so I wouldn't have to change any manual settings. I had to let almost all of the air out in order to get it below the surface of the water, even with the lead weight in the case. Since it wasn't a deep dive, I didn't have any problems with the housing shrinking around the camera at all.I was able to take some photos that I'm really happy with underwater and even above water. The glass doesn't seem to blur the image at all EXCEPT for when you're above water and have water drops on the glass. I also used this case while kayaking in the rain and those shots are blurry. Rated 4 out of 5 by Toro from Great product for the price I used it in the pool and on an ocean shark dive and it perform well and provided quality images. Easy to fit wider lenses without any cutoff. It's a little hard to use and to look through the plastic at the viewfinder/LCD. Needs to be weighted for better control. Will this work with a Nikon D800 and what is the widest lens you can use? Will a 15mm work? The D800 will certainly work but it will fit better with the optional battery grip. Not sure about the 15mm lens since I've never tried it on. Does it fit a Nikon D5300? Will this work with my D800e? I have use it with a canon 5D Mk III and worked fine, I guess will work with the nikon. The size are similar in those cameras.